My little fellowship is struggling with some pretty heavy existential issues. With the help of the Presbytery, folks here are taking a hard look at where things stand, and particularly where things stand relative to the vast edifice of a building in which worship is performed. With 30 good folks in worship on a typical Sunday, most of whom live nowhere nearby, the demands of facility are starting to weigh down on folk like a seven-thousand ton brick-and-mortar albatross. With minimal connection to immediate community, the "why" of the building gets louder and louder. There are some reasons to stick around, of course. There's the wonderful little nonprofit that the church has been incubating, which provides services to international adoptive families. At a recent event, that group pulled more people into the sanctuary than I've seen in my six years serving the church. There are also lingering emotional ties to the church for some, although those seem to be counterbalanced by the feeling of others that the building is haunted and/or cursed and/or built on top of a long forgotten maintenance tunnel leading to R'lyeh. That certainly would explain the bizarre geometries of the church architecture. It ain't non-Euclidean, but it comes close. We'll see where things go. Given that context, what was interesting to me this last week was the story of the financial collapse of a congregation that formerly shone bright as diamond in the Jesus world. 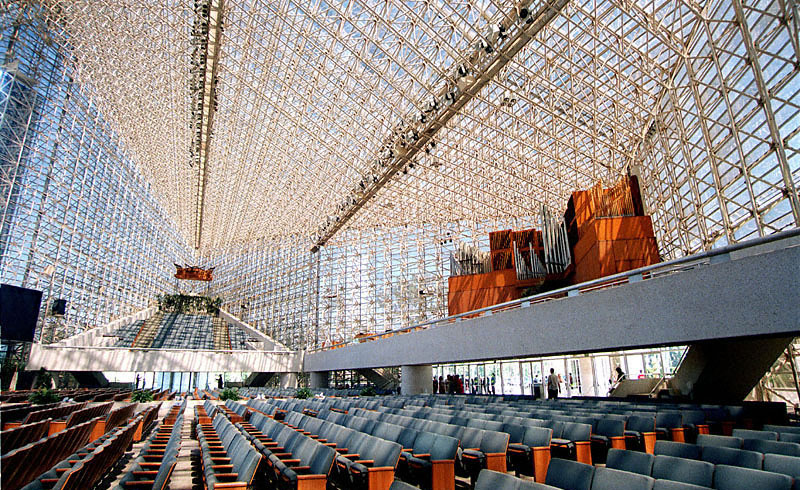 The legendary Crystal Cathedral, heart of Robert Schuller's ministry and a significant force in the Jesus Marketplace, is on the auction block. Schuller preached a message of relentless positivity, a Gospel of blissful self-empowerment. That plus charisma, well, it worked great in the me me 1970s and the greed is good 1980s. That's the stuff that built empires in the booming days of California. After Schuller retired, the church did what so many personality-driven churches do. They handed over the reins of pastoral authority to Schuller's kids. Leading congregations is a matter of call, not a matter of genetics, and so while this can sometimes work, it mostly doesn't. When you make leadership of a faith community a family business, it becomes less about meaning and purpose and God, and more about living in the manner to which you are accustomed. And honey, nothing annoys the Creator of the Universe more than PeeKays bellying up to worship looking for their cut. So when the church was first given to the son, and then, when that didn't work, the daughter, it found itself unable to meet financial obligations. They'd grown too much, had too many staff, and taken on too much debt. And then the California economy tanked. Despite have over 4,000 members, they just can't do it. As the pastor of a church where getting one-one-hundredth of that in worship feels like a triumph, I stand aghast and in awe at that. Four? Thousand? Members? And you're struggling? Sweet Lord Jesus. Now this immense edifice, this legendarily glorious shiny shiny temple to the Gospel of Prosperity, well, it's in the hands of creditors. The church has the opportunity to get it back, a bit like you might get back that big screen tee vee you hocked to Big Vinnie over at the Pawn n' Gun. The story stands as a testament to the fact that sometimes positive thinking is just self-delusion, and that the single minded pursuit of growth produces some pretty rockin' hubris. It's just so very American.